The Internet's most horrible items. A daily blog. 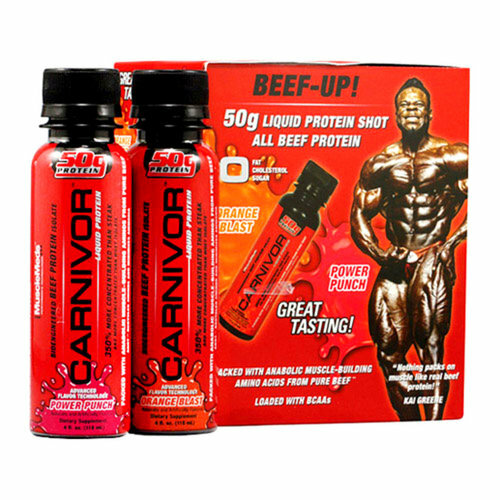 The 50 grams of protein in each of these Carnivor protein shots is made from approximately 6 ounces of raw lean beef. If you’re wondering “how can it taste good if you chemically process beef and condense it into four ounces of liquid?” the answer is that it doesn’t. The thick, sickly-sweet liquid goes down your gullet without too much complaint, but then there’s the aftertaste. To condense the beef into liquid, it’s hydrolyzed, which means it’s treated with enzymes to chop the long beef protein strands into shorter pieces. This mix of amino acids and short proteins tastes remarkably similar to protein that’s broken down inside your own gastric system by largely the same process as the hydrolysis. Which means: it’s vomit. It’s actual, honest-to-god beef vomit. If you ate six ounces of raw beef, let it digest a little bit, then horked it back up, mixed in a kool-aid packet, and sucked it back down, you’ve got Carnivor. And if you bought the twelve-pack, you’ve still got 11 to go. Help keep The Worst Things For Sale online and updating daily by giving as little as $0.10 a day! Join my mailing list and I'll write you occasionally when I have new stuff. TWTFS is a participant in the Amazon Services LLC Associates Program, an affiliate advertising program designed to provide a means for sites to earn advertising fees by advertising and linking to amazon.com. We are not affiliated with the manufacturers whose products appear on TWTFS. Contact drew at drew@toothpastefordinner.com or tweet him @TWTFSale.